I just can't believe how fast time flies. My wonderful husband and I have been married for 10 years! 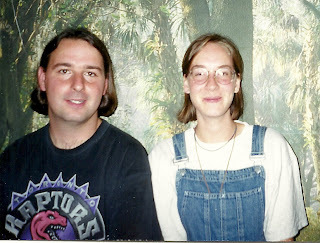 We met at Ontario Pioneer Camp almost 14 years ago now. Actually we had met before that becasue Jon knew my older sister, but we didn't formally meet each other until we were both working together. Oh it is the usual adorable camp story. He was a counsellor and I worked in the kitchen. We got to know each other while at camp and then he came to visit me as I stayed on longer. On our last day together he said he thought he loved me (my heat still races when I think about it). 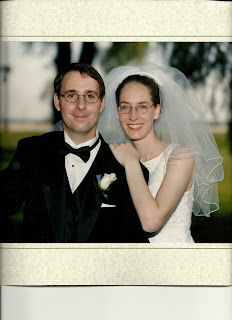 We were not sure about how things would work out because Jon was 26 and I was 17 at the time. Oh my did we really look like this so long ago?! After camp was over we went on a few dates. It is all the Lord's doing that we happened to live 15min apart. I moved to Japan for a year with my parents (my dad was working on an engineering project). Jon and I email a lot!!! Again God's timing came in to play. Jon got a night job and because of the time difference we were able to email in real time. After being a part for a year we dated again while I started engineering at McMaster University. We got engaged back at camp after dating for 2 years. We were engaged for another 2 years. During that time I think we probably over planned the wedding which turned out to be fantastic!!! Since then our lives, dreams, priorities, and everything else has changed so much. I finished a degree in Manufacturing Engineering, went to teachers collage, taught grades 4 and 5 at a private school for a few years, and had 2 wonderful boys. Now I am a stay at home mom who is also the office manager for our family business. If the Lord is willing we'd like to homeschool our children. Jon has worked as a Fire Alarm technician for several different companies, has also become a electrician, and started his own business (Integrity Fire and Control Systems Inc.). We have also lived in a few rental places, my parents (twice) and are still renovating our house. The house is nearing completion and we pray that the Lord will allow us to enjoy all our hard work so we stay here a little longer. Our new priority is to our God, and our children. 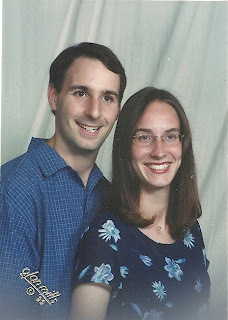 We are continually trying to expand our company enough for me to stay at home and enjoy our time together as a family. In all of our many wonderful year together we have learned that God is faithful, His timing is perfect (although He likes to be last minute with us to teach us patience). Jon and I try to talk often to make sure that we are on the same page in many areas of our lives. We try to be light hearted, humorous and care for each others needs. I look forward to many more years together! Hi! Thanks for visiting my blog!! You have two super cute boys!! Happy Anniversary!!! I wish you many more blessed years!! I love your wedding picture! You're gorgeous!